Villa Nova Wall Plaque with Your Street Address - - 23.5 x 13.5 (estate size) with two lines of text. 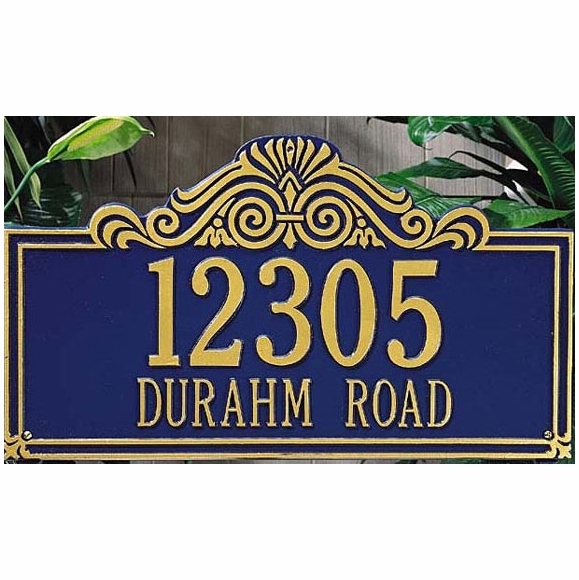 It's easy to add curb appeal and dress up your front porch with a personalized address plaque. Watch the Whitehall Distinctive Finishing Touches video. Line 1 holds up to 5 numerals; line 2 holds up to 17 characters. Line 1 characters are 4.5" high. Line 2 characters are 2" high. Each plaque is crafted from rust-free recycled aluminum. Paints have been specially formulated and weather tested to withstand the harshest elements. Made for you in the USA. 5-year mfg. warranty.